CHRISTMAS 1862. It had been a bloody year and December of 1862 proved to be a bloody month. The confidence and initial optimism of the Rebels had been dashed by the series of defeats at Forts Donelson and Henry in January, the loss of Nashville and the mid-South in the February and March, and then the stalemate at “Bloody Shiloh” in April. There was also the futile Fall Kentucky Campaign, where the Confederate forces almost conquered the Bluegrass state—but not quite. Back east, Robert E. Lee inflicted defeat after defeat on the Yankees, but still the blue-backs kept coming on against him. Spencer writes to his wife how the Yankees on the other side of the lines don’t even have their guns loaded and how both sides talk familiarly with each other, as if they were enjoying a time out in some sort of great game. For among all the death and dying, the Christmas spirit had still taken hold of both; North and South, all yearned for peace and home. As far as Thomas Nast was concerned, Santa was definitely a Union man. Out west, however, Christmas day was but a prelude to battle. No sooner was the holy holiday over than General Rosecrans, in charge of the newly renamed and reorganized Army of the Cumberland, marched out of Nashville to do battle with General Bragg’s Rebel Army of Tennessee, laying in wait for them in nearby Murfreesboro, encamped by the winding banks of Stone’s River. In the West there was no rest from war at Christmas in 1862. 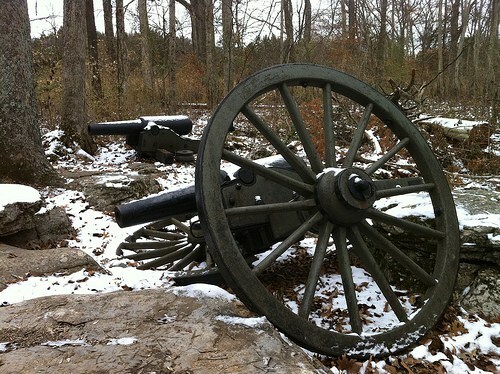 Broken artillery from the Battle of Stones River. On December 26, the two sides faced each other across the river, awaiting battle on the morrow. On one side a regimental band piped up; on the other side an enemy band replied in kind. One side played Dixie; the other Yankee Doodle; and so it went on the eve of battle, until the battle of bands ended with both sides playing Home, Sweet, Home in unison. The thoughts and prayers of loved ones at home on Christmas Eve were for the safety of their soldiers at the front. 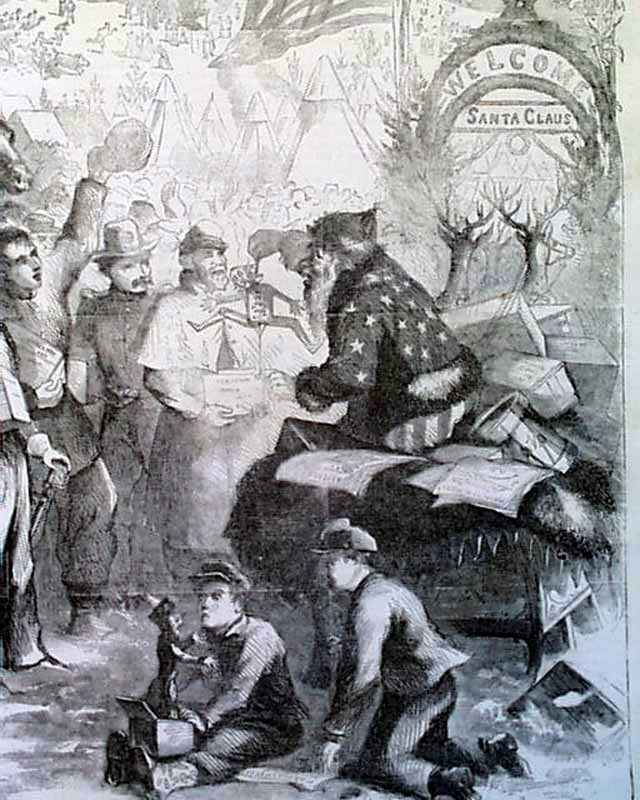 While in camp, it seems, Santa had declared for the Union cause—at least insofar as Thomas Nast was concerned. 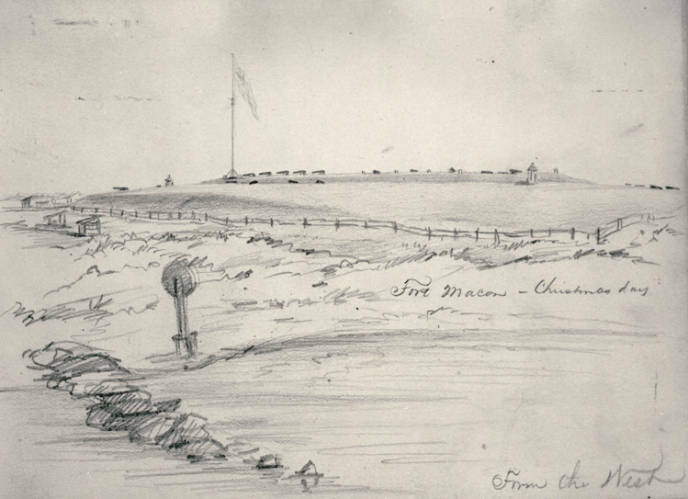 A field sketch of Fort Macon, Christmas Day, 1862. In camps North and South, Christmas was a more mellow holiday in ‘62 than it had been before; for many comrades who had shared their Christmas fare in ’61 were now dead and gone. All wished for peace; but none now dare hope for it anytime soon. For more about the Civil War, read Ghosts and Haunts of the Civil War and The Paranormal Presidency of Abraham Lincoln. Out now is Ambrose Bierce and the Period of Honorable Strife, which chronicles the wartime service of famous author Ambrose Bierce with the 9th Indiana and Army of the Cumberland.